THE One Kuwait: Where Price and Design Matter. the onederworld in india: latest news from barind! THE Onederworld in India: Latest news from Barind! THE One has been partnering with Free The Children’s WE Villages since 2008 to help build stable, thriving communities that give people the power and dignity to support themselves and break the cycle of poverty. While we’ve completed our project in Pimbiniet, Kenya, our latest projects in Barind, India are still ongoing. Here’s what we’ve achieved so far. In terms of the Education pillar, we have to date completed two classroom in Barind, outfitted with furniture and textbooks. Students now spend their studies in a bright, spacious classroom that is designed to let in as much light as possible and to remain dry in inclement weather. Construction work is also underway on a playground boundary wall, which will help to increase school pride and ensure a safe school environment. Improving access to clean Water is one of the most crucial and quickest ways to lift a community out of poverty. It reduces illness, allows girls to go to school instead of bearing the responsibility of fetching their family’s water, and leads to better agriculture and access to food. In Barind, we have rehabilitated the school’s hand pump, enabling students and community members to access clean and healthy water. The pipes were further replaced to ensure that the water system remains operational for years to come. In terms of Sanitation in Barind, construction of one latrine block has been completed, which consists of 5 latrines and 5 urinals. The latrines provide a safe and clean sanitary space for students, further supporting the regular attendance of girls in the community. It also provides students with the opportunity to learn proper hand-washing methods and basic hygiene. Students and community members have also participated in training and workshops on boiling and storing water for safe consumption and healthy hygiene practices. The Health pillar in Barind has been focused on the construction of a local Anganwadi (health centre), which will open in Spring 2017. This centre will be a safe and centralized location for community members to have all of their health needs met and will also provide year-round opportunities for maternal and infant health. It will benefit over 260 community members and also serve as a daycare centre for 39 children from the ages of 3-6 years old. We have furthermore been able to work closely with households to provide training on the harmful effects of smoke pollution. 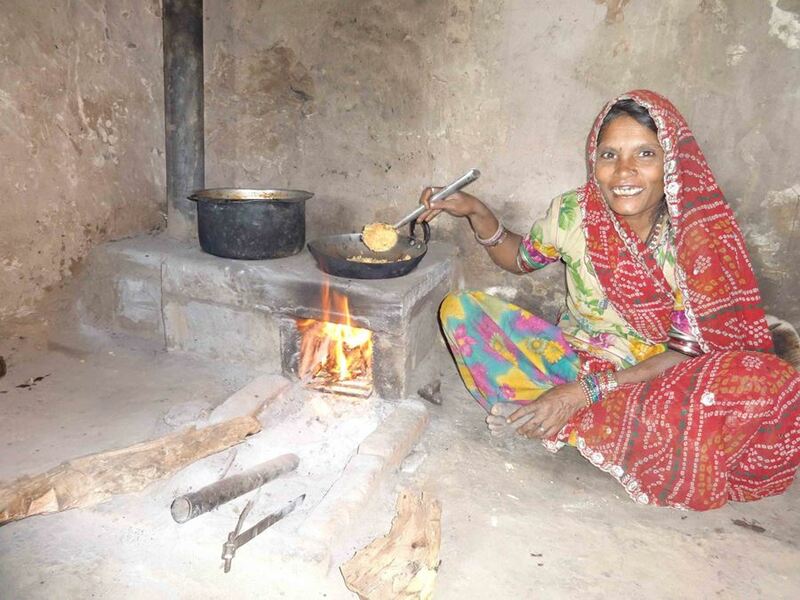 We have so far installed 68 smokeless chullahs (cooking stoves), which improve air quality by funneling smoke outside the home and trained community members on the use and maintenance of these stoves. Regarding Agriculture and Food security in Barind, there has been a tremendous amount of programming on improved agricultural techniques and practices. Farmers have had the opportunity to learn about intercropping to increase productivity and better return nutrients into the soil. Intercropping with corn and soya ensures that a high level of nitrogen is returned to the soil, yielding better corn crops, and enables farmers to grow multiple crops in the same field. The community of Barind also received training on the MB plough for use in the coming seasons. While farmers do use ploughs, the type of plough in use in Barind has been unchanged for hundreds of years. By adopting the MB plough, farmers will be better able to turn soil over which improves aeration, kills insects or weeds that could damage crops, and mixes organic product into the soil. We are truly changing lives through THE Onederworld! Watch this space to track our progress.